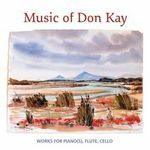 Music of Don Kay : works for piano(s), flute, cello. Hastings triptych : three pieces for flute and piano / Don Kay. Contents note: I. Hastings Bay (6 min) -- II. The caves (5 min 50 sec) -- III. Lune River (3 min 50 sec). 19 Oct 07: Recital Hall, Conservatorium of Music, University of Tasmania. Featuring Fiona Perrin, David Bollard. 12 Jul 86: Australian Academy of the Humanities Conference, Government House, Hobart. Featuring David Cubbin, Geoffrey Lancaster.